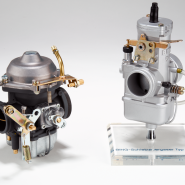 BING has been producing carburettors for motorcycles from 50 cc to over 1000 cc for more than 70 years. Experienced engineers are optimising the development of the carburettors for fuel consumption and exhaust gas emissions on modern test rigs to protect the environment. Our own rolling road vehicle test bed is supporting us in this work. BING carburettors for stationary engines and industrial engines were developed for the most diverse areas of application. Whether in chainsaws, lawnmowers, motorised cultivators, sprayers, water pumps, outboard motors, road building machines – in all cases the high quality of the BING carburettors guarantee best operation of the machines. Model airplanes, ultra lights or light weight airplanes, from Japan to Australia – many manufacturers world wide trust our years of experience, our technical know how and the high quality of our products.